There has been an electric version of each generation Smart Fortwo. Late in the life of the first model, an electric version was launched as a test-bed for the technology, but since then the popularity of EVs has grown massively. 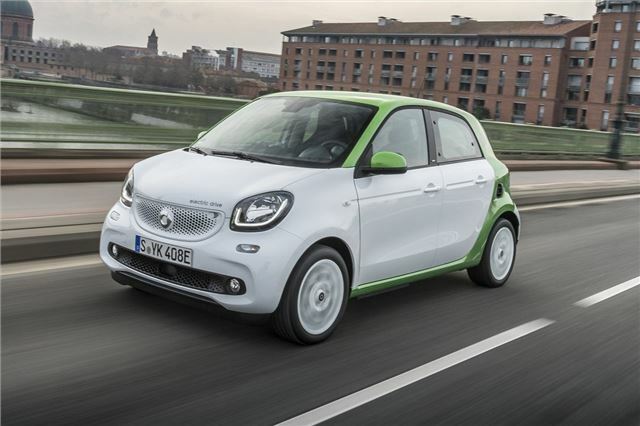 Which explains why you can now get electric versions of both the Fortwo and Forfour. And it’s the five-door, four-seater Forfour that Smart believes will be the best seller in the UK. Although prices hadn’t been set at the time of testing, the Forfour should reflect other models in the range and command a £500 premium over the Fortwo. 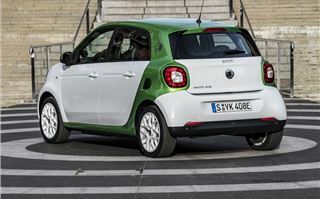 The Smart Forfour is a joint development with Renault that also spawned the current Twingo. The Forfour Electric Drive is produced in Slovenia, but the drivetrain is manufactured by Renault in France. There is no word on whether an electric version of the Twingo will be launched, but Renault already has a compact EV in the Zoe, so maybe it is unnecessary. Potential battery range in the Forfour is slightly lower than in the Fortwo (96 miles instead of 100 miles), with maximum power of 81PS from the electric motor and top speed electronically limited to 80mph to avoid wasting charge unnecessarily. The car will be sold with a standard 7kW charger, meaning it can be charged in around two and a half hours from empty using a 16 Amp socket. Early in 2018, Smart will launch a 22kW on-board charger, which means the Smart could be charged in around 45 minutes using a 32 Amp charger. 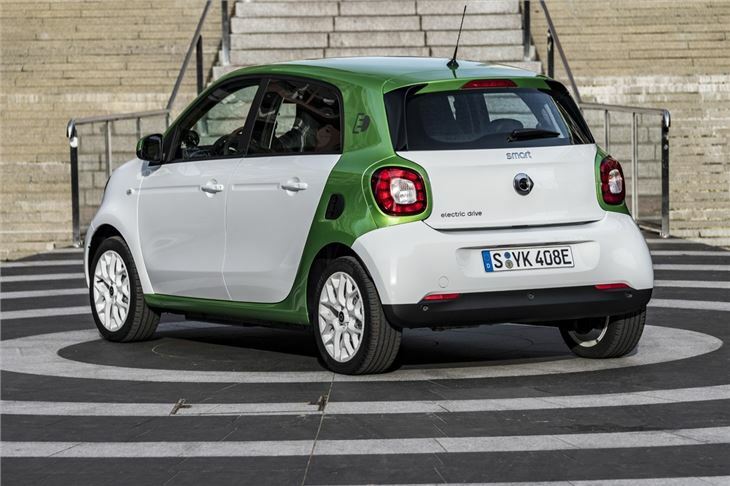 Smart had considered delaying the launch of the Electric Drive models until this rapid charging system was available, but has decided to introduce it with the 7kW on-board charger. Like other Smart models, customers will have a wide choice of customisation through colours, accessories and factory-fitted options. The Electric Drive design package (exact UK specification is still to be confirmed) adds the Tridion safety cell and door mirror caps in exclusive ‘electric green’. The interior is distinguished from other Forfour models by additional dashboard instuments, including a power meter and battery status display. One of the unique features for Electric Drive is a radar-based recuperation. It’s active in the basic transmission mode and it monitors traffic ahead to anticipate the optimum level of energy recuperation directed back to the battery. For example, if it senses the car will have to stop in traffic ahead, it can activate a stronger level of recuperation, which will have the effect of slowing the Forfour at a faster rate. There is also an ‘eco’ button, adjusting the performance to ensure the car’s range is maximised. The Forfour Electric Drive is nippy around town and despite being slightly less powerful than a Renault Zoe, it will actually accelerate quicker. The Forfour takes 12.7 seconds to reach 62mph from rest, while a Zoe covers the same in 13.5 seconds. Like most small electric cars, the Forfour is at its best around town, eager to take advantage of gaps in traffic with responsive acceleration. There is an app to access key information about the status of the Forfour Electric Drive, which can be viewed on a smartphone, tablet or PC. It enables pre-entry climate control when the car is plugged in and charging can be controlled remotely. The former saves valuable range by ensuring the car’s cabin is at your desired temperature while drawing electricity from the grid rather than draining the battery after starting it up. Like other Smart models, there are three equipment grades: Passion, Prime and Proxy, with power steering and heated front seats standard from Prime, as well as a lane-keeping assistant. Options include a winter pack which adds a heated steering wheel and improved insulation, while customers can also choose Brabus accessories for a more sporty look. But this brings us back to perhaps the key issue for anyone considering a new electric car. The maximum range on the Forfour is 96 miles, according to the official test cycle, and in winter it wouldn’t be surprising if this fell to 60 or so miles, with heated seats and climate control as well as headlamps and windscreen wipers adding to demands on the battery. The car launches in 2017 when Renault has introduced a version of the Zoe with a theoretical maximum range of 250 miles. Opel (but not Vauxhall) in mainland Europe will launch the Ampera-e, capable of up to 300 miles on a single charge and the company says travelling 186 miles on a charge, regardless of road conditions, is a certainty. Smart will say that for most people choosing an electric car, the ability to cover short journeys is all they need. And for many, it’s a second car or at least not the main car of the household. And when the 22kW charger version launches in 2018, the improving public charging network, along with rapid-charge ability, will boost the Forfour’s capability. But we can’t help feeling the company should have been a bit more ambitious and given more people a reason to switch to electric.